We had pretty interesting couple of weeks in the digital marketing world. Earlier, most of the platform announced their quarterly results which was followed by launch of some new features. And Instagram Stories definitely caught everyone’s fancy. Not because of the new feature but more so as it resembled closely to Snapchat Stories. The new feature, just like Snapchat Stories, allows users to share a photo or 10 second video on Stories with a life of 24 hours. Now what does that mean to marketer and brands? And more importantly, should Snapchat be worried? 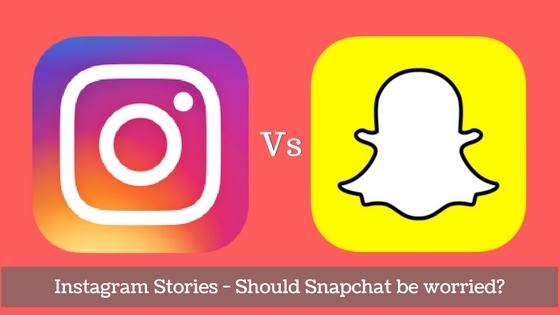 Instagram Stories – Who will win the game? Instagram’s claim to fame was filters that people could apply on their photos and share within the community. Features gave power to people to make their photos look better without using tough-to-learn photo-editing softwares and it was quicker too. Snapchat took that experience a little further. You had filters on ‘snaps’ which could be either photos or 10-sec videos. Apart from that, you could add location filters or like they call it – geo filters too. Giving more power to people, you could create your own geo-filter and submit too. Add to that, the power of emojis, which were recently introduced. And there you have a fun platform that entertainers, personal marketers loved it. Just think, Snapchat reaches 41% of all 18 to 34 year-olds in the United States every day and they owe it to user experience. Many of us know that Instagram had been for long facing a growth fatigue. The MAU or the monthly active users were not improving much over last few quarters. Compared to it, Snapchat was getting much popular and more users were moving from Instagram to Snapchat, thus lowering the engagement on Instagram. Though, over last few quarters, Instagram came up with Sponsored updates and algorithm based feed and arrested the sharp decline as well as monetized the platform better. Now with addition of Stories feature, I have seen more engagement on Instagram which could mean that they are on a path to recovery. Now this aspect I believe is a deal clincher. We have always known that it’s not easy to ‘Discover’ someone on Snapchat. You have either seen a Snapcode on some other platform or were recommended by someone. Compared to that, it is much easier to find people on Instagram. You could use either a hashtag and follow people using that hashtag or find via the visual search tool. Also, given the fact that the platform has been around longer than Snapchat, many users already have a strong follower base in place. In a nutshell, I believe that this is Instagram’s battle to lose. And if Snapchat still wants it’s share of dollars, they will have to build strong discovery features as well as come up with other really innovative features to take the wind out of Instagram Stories.